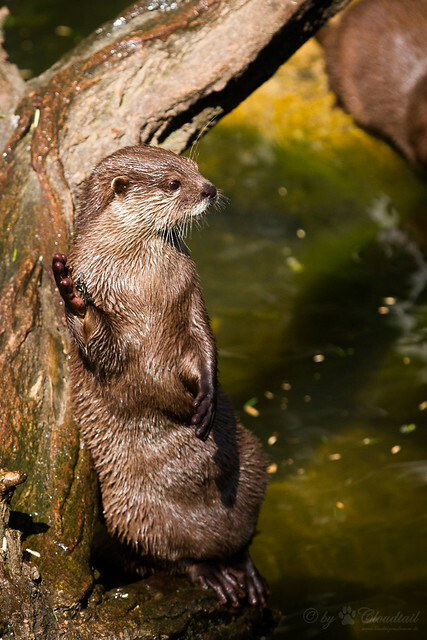 Our Open Thread this weekend is hosted by this very cool otter. ‹ The 75th Down Under Feminists Carnival is up! Update on the Cert II: This week is work experience. I got told on Monday that my work experience location had been altered (I’m now doing my work experience in the office where we’re doing the training), so that was fun. Started the work experience on Wednesday, and since then I’ve been doing filing, more filing, lots of photocopying, sticking labels on file boxes, and some filing for seasoning. Fortunately I did an ASO1 traineeship with the Department of Social Security back in 1996, when they were still largely using paper files, so I know from filing and it’s no great hardship. Unfortunately, I appear to have caught the cold our trainer was valiantly battling through. Just over the course of the past night, I’ve been coughing a lot, and my throat is all scratchy. So I know what I’m going to be doing this weekend – namely, spending a lot of time drinking either lemon and honey, or hot lime cordial while cursing rhinovirus. I has the bug of glazed eyes and braindeath, so nothing sensible from me until further notice. Oh, I had that last weekend and still have the lingering remains (that’s why I haven’t posted this week – I have too much other overdue stuff hanging over me that taking time out to blog felt wrong). You have my sympathies, Aqua. I did start a subthread over at Feministe’s Open thread a few hours ago about how I don’t want bloody Stallone mucking up my fantasy all-woman action movie by shoehorning into the bloated and cheesy Expendables series. Of course I want a movie where as many as possible of Sigourney Weaver/Helen Mirren/Nichelle Nichols/Linda Hamilton/Judi Dench/Michelle Yeoh/Pam Grier/Lynda Carter/Geena Davis quip and/or scheme while Uma Thurman/Angela Bassett/Lucy Lawless/Jodie Foster/Kate Beckinsale/Carrie Ann Moss/Vivica A. Fox/Mila Jovovich/ Zhang Ziyi/Halle Berry/Aishwarya Rai/Penelope Cruz/Angelina Jolie/Queen Latifah roll their eyes at the excessive energy expended by Zoe Saldana/Scarlett Johansson/Rosario Dawson/Chloe Moretz/Rutina Wesley/Chiaki Kuriyama/Jennifer Lawrence/Keira Knightley/Michelle Rodriguez/Sarah Michelle Geller/Kareena Kapoor/Amandla Stenberg doing the gratuitously gymnastic arsekicking. Just don’t make it a cheesy Expendables movie. I favour Joe Manganiello for token male, although Daniel Glover would be just fine if one wants a wisecracker as well as eye-candy. It’s a sunny warm winter weekend here in the West, so most of what is happening in my life this weekend is… laundry. Big laundry day here too. Also trying to do voice practise without overstressing a slightly dodgy throat. It’s not inflamed enough to stop me singing entirely, but I have to do a longer warmup and be more closely focussed on technique while singing the songs. I was trying to think up a list of the joys of laundry but apart from clean sheet night and empty washing hamper I am a bit stuck. An *empty* washing hamper? I rarely see such a thing, except very briefly when I dump it out and put the top stuff back in first, so that the stuff on the bottom gets a chance to be washed *sometime*. The homely charm of washing hanging on the line, maybe? Laundry is exercise right? I actually had less than usual this weekend, as it has been sunny for a while here and Mr a was able to get a lot done during the week. Still, the laundry basket never empties, as my kids have a tendency to put stuff in there that I have no intention of washing, like raincoats they have worn once. Anyone knowledgable about the best material for re-stringing Bohemian crystal bead necklaces? Hate laundry. Sisyphian curse without even the grandness of a boulder. …without even the grandness of a boulder. What an excellent way to describe laundry! Hey Orlando. It depends on the size of the beads and the effect you want in the final necklace. If the beads ( or, more to the point, the holes in them) are very fine you might be limited to fine nylon beading thread. If the beads are larger you could use nylon coated beading wire (aka tigertail). This is stiffer than thread and the necklace will not move as freely, but it is very strong. Supposedly, some of the more expensive brands, like Softflex, are a bit floppier, but I haven’t tried these so I couldn’t say. Finally, if your beads are fairly chunky, but not too heavy, and you don’t mind if your necklace won’t last as long, you could use silk. This is more authentic if it is an heirloom necklace, and will allow the necklace to move more naturally, but is likely to wear out quickly (especially if your crystal beads have sharp edges). Hope this helps. I think I dislike doing dishes more, possibly because I don’t have a dishwasher? I remember reading a feminist list of Most Important Inventions of the Twentieth Century, and it definitely included the washing machine and reliable contraception. Because laundry without a washing machine is truly horrendous. Automatic washing machines, where you just set the cycle, kick the silly thing off, and let it get going, are an absolute godsend. I can remember how difficult washday was for my mother with even something as semi-advanced as a twin tub machine, where the agitation and the spinning was automated. The thought of having to do washday as my great-grandmothers did, in the days of the copper, horrifies me. In other news, the bug I’ve caught appears to be a particularly nasty one. I’ve been coughing and hacking for the last four days, to the point where my abdominal muscles ache, plus I’m stuck with a mild fever (so nothing really strong enough to budge the little blighter). To top it all off, it’s starting to move into the “head cold” set of symptoms as well, so my nose is blocking up on a regular basis. So, lots of Throaties to try and soothe down the barking, lots of warm liquids to keep me hydrated, and lunch today is instant noodles in powdered soup stock because that’s quick and easy to make, and it means I don’t have to think too hard about eating it. Great-grandmothers? That was my mother! (I am either very old, or come from a really poor family.) Nana used to do the washing in the copper on a Monday, and Mum worked with her all day. My grandad made her a mangle to squeeze all the water out: it was hell on buttons, apparently. It is possible that it wasn’t exactly a copper. Mum also used to tell me that Nana had only ONE dress. And that she, Mum, used to cycle 21 miles IN THE SNOW to get to work. In later years she conceded to 7 while reminding us we were none too big for a clip on the ear. I’ve always believed it was a copper. But maybe Nana only had one GOOD dress. Because otherwise, she was hanging round Monday and Tuesday washing and then waiting for the dress to dry in her petticoat. Or else, she NEVER WASHED IT. There’s a fine line between a good story and a lie and I have to say, my mum (who NEVER LIED) may well have been playing hopscotch over it for many a year. I’ve just had a scammer from India ring me and tell me that my InterNet access was going to be cut off for six months. They claimed to be from Telstra. When I said “This is a scam, I’m going to ring Telstra” they hung up. I’ve gotten the calls about alleged viruses on my computer, but this one is new. I’ve been on the ACCC website and filed an alert, and there wasn’t really a category for it. Does anyone have any idea what they hoped to gain? They were going to offer me Internet access through another company? Fishing for my details? I had a twin tub when I was a student. I couldn’t afford a proper washing machine. For several months before getting that my sister and I washed our clothes in a bucket. It wasn’t too bad in summer, but sucked badly in winter. Mr a and I kept the twin tub for a while. It was really useful for dying things. In other news M<a href=”http:// http://geekfeminism.org/2014/08/12/quick-hit-maryam-mirzakhani-wins-the-fields-medal/” rel=”nofollow”>aryam Mirzakhani has become the first woman to win the Fields Medal. Yay Maryam. Snap! Angharad. I also wanted to congratulate Maryam Mirzakhani. This is almost-but-not-quite collapse of the old world order stuff, based on the number of people who’ve long held little lady brains just can’t do profound and original maths. I was going to point to the official page: http://www.mathunion.org/general/prizes/2014/ , which includes a link to a PDF about her work, written in the mathematicians’ typesetting system, Tex (at least, that’s the classic Tex font, which is hilarious because part of the whole point of Tex was supposed to be font flexibility – I love these endearing idiosyncrasies). Greatly enjoying the latest from Joe “Mr. Austerity” Hockey. Poor people don’t have cars, therefore the tax excise on petrol won’t be a burden on them. I deduce from this that Joe defines anyone with a car as rich, therefore the tax excise won’t burden them either. Orlando, late coming in, but I’ve taken to putting necklaces on wire when their threads snap. I had a tigertail threading snap once, so I’ve become very suspicious of any sort of cord. I use the wires you curl into links (can’t recall what you call it). It makes the necklace longer, and it still hangs freely, and adds gold/silver spacing. ellish @ 19: One thing which I haven’t seen mentioned in any of the many de-bunkings of Smokin’ Joe’s latest bit of bunkum is a mention of one other important factor about cars belonging to people down the lower end of the income scale: they tend to be older models, which are comparatively less fuel-efficient and reliable than the more recently manufactured cars of the people up the upper ends of the income scale. So a poorer family is more likely to have to pay for more fuel, more frequently, out of less income than a more wealthy family. They will, therefore, be harder hit by an increase in the fuel excise. However, Joe is sticking to his guns, asserting the rich pay “more” taxes than the poor, and are therefore the ones we should be coddling.